We will customize our services to meet your childcare needs. And since childcare needs do not always occur during 'normal' business hours, we are proud to say Nanny Poppinz is available 24 hours a day, 7 days a week including holidays! There are NO UPFRONT CHARGES OR APPLICATION FEES! Our fee would only be due if you select a Nanny we have referred to you. As parents, we are faced with a variety of childcare options. Like you, we understand that the decisions we make regarding the care of our precious children are one of the most important things we will ever do. Quality, integrity, trust, safety, and compassion are just some of the values that you will discover when working with our Jacksonville Nanny service. Many of us do not work traditional hours, we travel, we are single parent households, we attend school, and we struggle with Jacksonville traffic! We deal with the threat and fear of illness in the traditional Jacksonville daycare centers and we face logistical challenges with work schedules that do not fit conventional daycare/after school programs. Most importantly, we yearn for a solution that offers individual, quality care for our children. Nanny Poppinz offers an innovative choice for all of your childcare needs and desires! We can help you find a Nanny with whom you can perfectly fit the needs of your family. Nanny Poppinz believes we are uniquely qualified to recruit, interview, screen and refer only the premier available Jacksonville. We truly understand the needs of our clients and how to provide the utmost in customer satisfaction. we would not use in our own home!" Give Nanny Poppinz a call so that we can help you with all of your Jacksonville childcare needs and provide you with the peace of mind that comes with knowing your children are receiving the best care there is to offer! CPR , First Aid and AED training will be provided by CPR Training Associates. Nannies can schedule their CPR course by calling 904-387-4CPR or emailing hmeeks74@yahoo.com to make a reservation. Identify yourself as a Nanny Poppinz Nanny when you make the reservation (You will receive a discount). After the completion of the course and when you have been referred as a part or full time Nanny you will need to send the course receipt (which CPR Training Associates will provide) to Nanny Poppinz and you will be reimbursed by Nanny Poppinz for your CPR training cost. 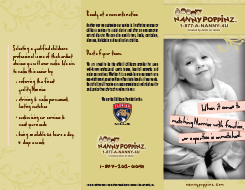 For information on how to become a Jacksonville Nanny Poppinz Nanny and to schedule an interview please call Dasly at 954-899-3828..
Nanny Poppinz offers discounts to Military and Law Enforcement families.